One of Jacob's very favorite things is his star mobile. He loves to stare up at it while I change his diapers. It holds his attention longer than almost anything else. Sometimes he doesn't even look at the actual mobile, but at the star shaped shadows it casts on the wall. Recently I got to help a friend make one for her friend. Her friend suffers from the same syndrome I do that makes getting pregnant, and staying pregnant, difficult. So it was super special to me to get to help make this for the new momma. 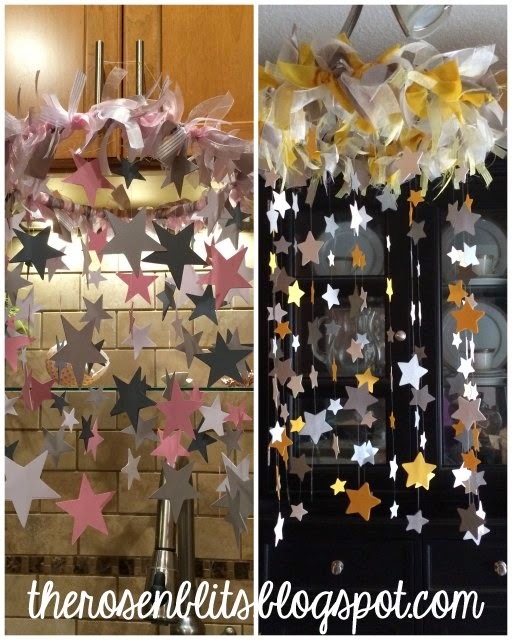 Cardstock Stars - I used a cricut to cut out mine. You could also use a silhouette, or even star shaped hole punches if you don't have a machine. Other shapes would be fun too! Try to get stars in different sizes if you can. You're going to want them in colors to match your nursery. I prefer to use multiple colors for the same reason I like multiple sizes - it provides visual interest. A wooden craft hoop - you only need the inside. Ours was about 10' across. Fishing or craft line - translucent is best. Scrapbooking glue - we used ek tools brand. Ribbon - in colors to match your stars, I used both sheer and solid for visual contrast. 1. Cut your ribbon into about five inch strips. 2. Tie the strips around the hoop using a knot to hold in place. I like to alternate colors and textures. Multitasking and holding a baby at the same time is optional. Match up your stars so you have two of the same size and color back to back. Glue the stars onto the fishing line using the scrapbook glue. You're essentially making a star sandwich with the fishing line in the middle. Don't space the stars too close together, leave about an inch between each set. Tie the fishing line onto the hoop. Just slide the ribbon aside to get it onto the hoop. A double knot should do the trick. 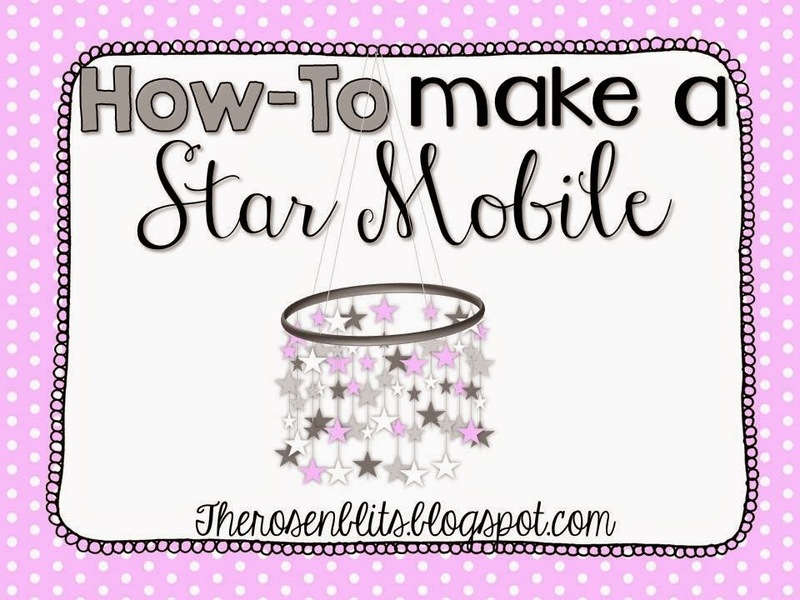 Continue making star lines and tying them onto the hoop until you've made it all the way around the hoop. Tie on a line or two to the top to hang it from. And you're done and ready to hang! I hung Jacobs using a simple screw in hook. A few days later Jacob had a second cousin born up in Maryland, so I made another in their nursery colors of yellow, gray, and white. 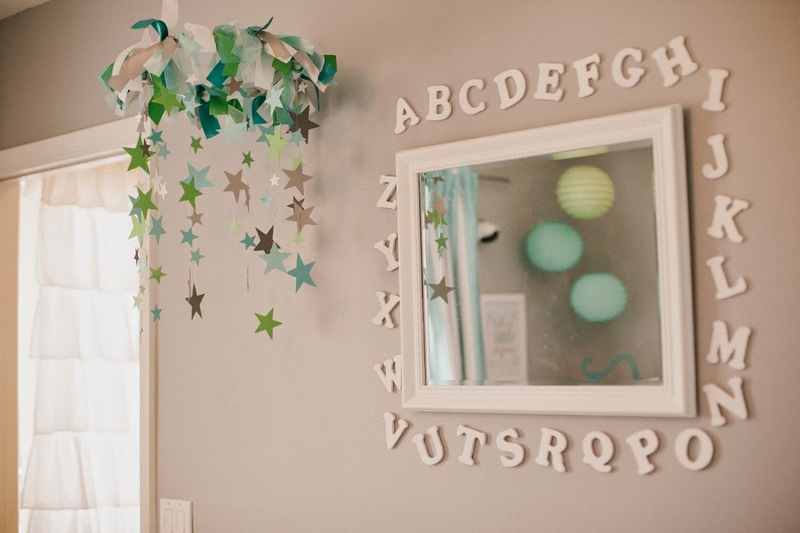 These stars were made using a paper punch from Michaels. If you are planning to ship your mobile, I recommend folding up each strand and paperclipping it so they don't all tangle together in transit. Then wrap it, including a hook to hang it if you like. I recommend including instructions letting the new parents know how to hang it up, with a picture of what it looks like unpaperclipped. Hope little Mackenzie and Declan love their mobiles!